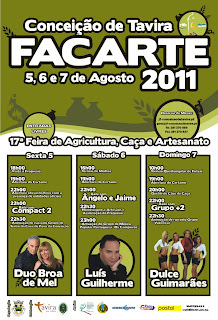 I live in Conceicao which is a village about 3miles from Tavira. It is right on one of the main roads that go across the Algarve, it is a traditional kinda place where everyone knows everyone and have lived here all their lives. It is a slow moving place and picks up in summer but is not a hugely popular place for tourists. Its the kind of place where people smile and say hello in the street and compliment you on your beautiful children. And although I dont really feel completely integrated, it is a nice place to live where people are familiar, friendly and helpful. 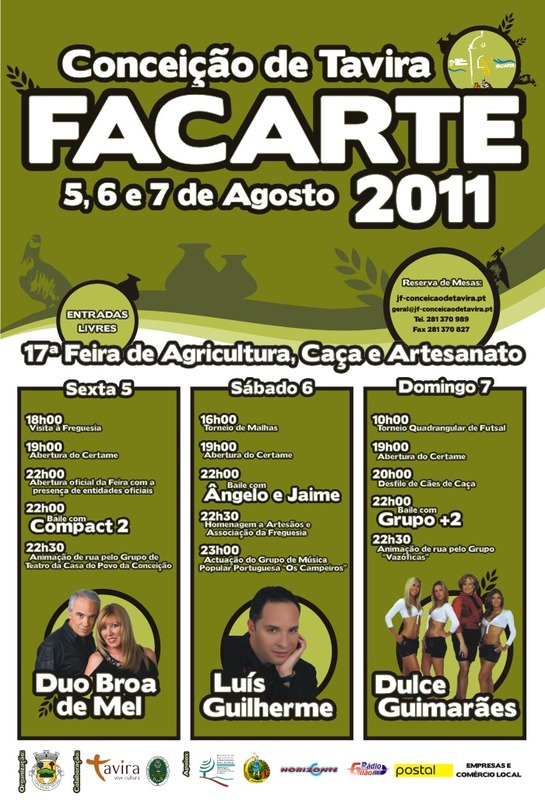 But this weekend is the 17th Facarte (Feira da Caça, Cultura e Artesanato) in Conceicao, which is the Fair of hunting, culture and arts which runs for 3 evenings. This is the third year we have seen it and every year it gets a little bigger. They have local producers displaying their arts and crafts, foods, sweets, pottery and have live entertainment (nothing much to do with hunting). It brings in thousands of people every year. And I like it because it brings Conceicao alive, it takes a good two - three days for everything to be put up, the stages and stands and to see it at night full of people is lovely for our sleepy little corner of the world. And of course, it is very beneficial to the local businesses. Last night, I was watching some of the entertainment, we live right opposite the 'village square' if you like. And although it is quite folksy and not my kind of music at all, people here like it, it was packed with families and large groups of friends. People get up and dance, mothers with their children, friends with friends, husbands and wives etc, you get the idea. But people are happy and having a good time on a warm summer night. Tonight I will take my girls over to have a look and they have some stalls with sweets and candy floss etc and a couple of small kiddy rides and just enjoy the atmosphere and bustle of my sleepy village, Conceicao. Please note, this has been written with an english computer and I dont have the appropriate accents, its not that I am not aware of how to write the proper names of places.